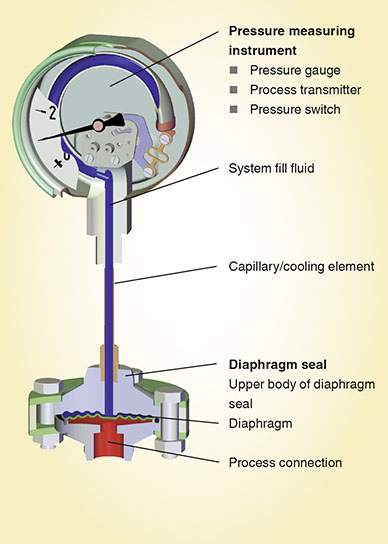 The process side of the seal is isolated by a flexible diaphragm. The internal space between this diaphragm and the pressure measuring instrument is completely filled with a system fill fluid. The pressure is transmitted from the measured medium by the elastic diaphragm into the fluid and from there to the measuring element, i.e. to the pressure measuring instrument or the transmitter. 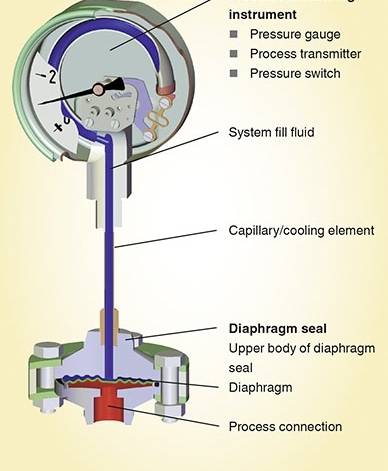 In many cases, between the diaphragm seal and pressure measuring instrument, a capillary is connected in order (for example) to eliminate or to minimise temperature effects from the hot fluid to the measuring instrument. Diaphragm seals are mounted to existing fittings or flanges. Usually the fittings consist of T-pieces which are integrated into a pipeline, or of welding sockets which are welded to a pipeline, the process reactor or a tank. 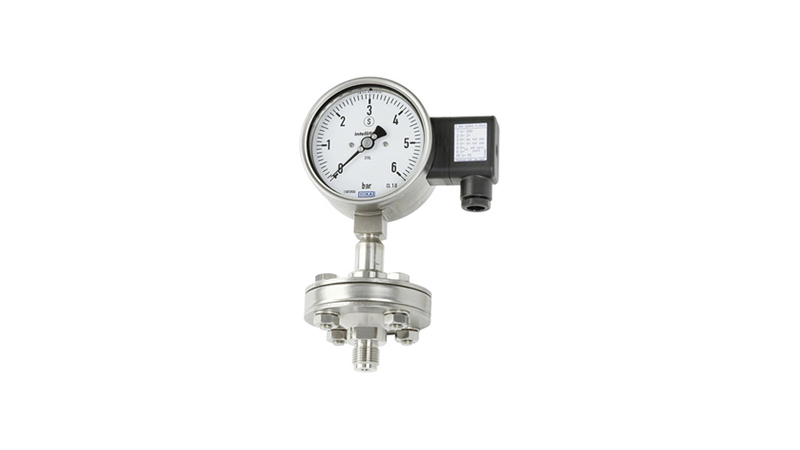 This diaphragm seal type offers the advantage that the “contact surface” between pressure medium and diaphragm is relatively large, thus ensuring accurate pressure measurement, especially for very low pressures (< 600 mbar). The fact that they can be easily dismounted, e.g. for cleaning or calibration purposes, is a further advantage. Further information on diaphragm seals can be found on the WIKA website.